LAIRD, Melvin Robert, a Representative from Wisconsin; born in Omaha, Douglas County, Nebr., September 1, 1922; attended the public schools; B.A., Carleton College, Northfield, Minn., 1944; United States Navy, 1942-1946, Pacific Theater; awarded the Purple Heart; member, Wisconsin state senate, 1946-1952; delegate to the Republican National Conventions, 1948, 1952, 1956, and 1960; elected as a Republican to the Eighty-third and to the eight succeeding Congresses until his resignation on January 21, 1969 (January 3, 1953-January 21, 1969); Secretary of Defense in the Cabinet of President Richard M. Nixon, 1969-1973; domestic adviser to President Richard M. Nixon, 1973-1974; senior counselor for national and international affairs, Reader’s Digest Association; died on November 16, 2016, in Fort Myers, Florida. Papers: 1904-1979, 78 cubic feet. The papers of Melvin Robert Laird primarily document his pre-1969 political career. Also included is brief personal and family correspondence and papers of Melvin R. Laird, Sr. (1877-1946), also a Wisconsin legislator, and his grandfather William D. Connor (d. 1944), a former lieutenant governor and state Republican Party leader. Biographical information about Melvin Laird, Jr. includes an oral history interview and clipping scrapbooks. State legislative papers consist of alphabetically arranged correspondence with constituents, other legislators, and advocacy groups and subject files on topics such as taxation and veterans housing and benefits. 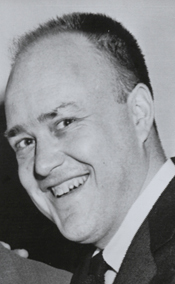 Congressional papers include correspondence and memoranda exchanged with national legislative and party leaders, governmental departments, advocacy groups, district staff in Marshfield, and constituents; files on legislative committees on which he served such as the powerful Appropriations Committee and the Republican Conference and on party committees such as the Joint Committee on Republican Principles (1962) and several National Convention Platform committees; and subject files on topics such as the dairy industry, national defense, health care, and termination of the Menominee Reservation. Additional files document Melvin Laird's political campaigns and support for the Nixon presidential campaigns in 1960 and 1968. Extensive speeches, writings, and publicity materials include full runs of weekly columns, newsletters, press releases, speeches and interviews (some of which are present as audio or video recordings), and films of his weekly television program, "Your Washington Office Report." Photographs received with the collection consist primarily of publicity shots of Melvin Laird, his family, office visitors, and state and national leaders (including Dwight D. Eisenhower and Richard M. Nixon), as well as visual documentation of his interest in military and health care issues. Original prints are available at the Visual Materials Archive in Madison; photocopies are available with the papers. Documentation of Melvin Laird's leadership on defense issues while a congressman continues in a limited quantity of papers created as secretary of defense. Most complete are the detailed daily schedules (also available on microfilm), photocopied public statements and interviews, and congratulatory and personal correspondence. The two folders documenting W. D. Connor consist of congratulatory letters. A register for the papers is available in the repository. Melvin Laird is also a subject in a number of other collections at the Wisconsin Historical Society. Papers: (1941), 1953-2003, 132 linear feet. The papers of Melvin Robert Laird are partially processed and open for research. See www.fordlibrarymuseum.gov/guides/findingaids/laird.htm for a description of the collection. Oral History: ca. 1965-1985, 6 interviews. The oral history interviews with Melvin Robert Laird were conducted by William Syers and Robert Peabody. Audio: In the WHCA Sound Recordings Collection, Series "E" — Secretary of Defense Briefings, January 30, 1969-October 25, 1972. The "E" Series consists primarily of briefings, remarks and press conferences by the Secretary of Defense, Melvin R. Laird; there are some recordings of other Defense Department officials. Papers: In the Henry A. Kissinger Telephone Conversation Transcripts (Telcons), 01/21/1969-08/08/1974. Collection includes telcons between Dr. Kissinger and Melvin Laird. Audio: In the White House Tapes collection. Melvin Laird is included in many of the taped conversations. Laird, Melvin R. Beyond the Tower Commission. Washington: American Enterprise Institute for Public Policy Research, 1987. ------. Energy, A Crisis in Public Policy. Washington: American Enterprise Institute for Public Policy Research, 1977. ------. A House Divided: America's Stragety Gap. Chicago: H. Regnery Company, 1962. ------. People, Not Hardware--The Highest Defense Priority. Washington: American Enterprise Institute for Public Policy Research, 1980. ------, ed. Republican Papers. New York: Praeger, 1968. Laird, Melvin R., and Lawrence J. Korb. The Problem of Military Readiness. Washington: American Enterprise Institute for Public Research, 1980. Van Atta, Dale. With Honor: Melvin Laird in War, Peace, and Politics. Foreword by Gerald R. Ford. Madison: University of Wisconsin Press, 2008.